Grease slow cooker with butter or cooking spray. 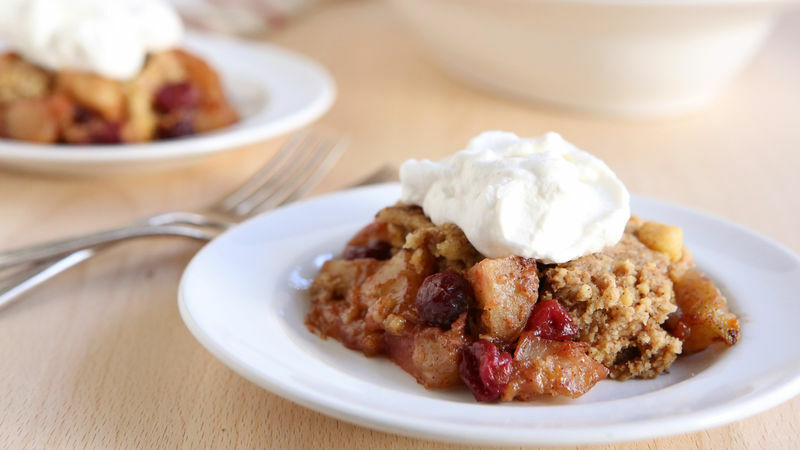 Add sliced apples, cranberries, vanilla, brown sugar and 1 teaspoon of the cinnamon to slow cooker; toss to combine. In separate bowl, mix dry cake mix and remaining 1 teaspoon cinnamon. Sprinkle over fruit. Drizzle with melted butter. Cover and cook on High heat setting about 3 hours or until fruit is bubbling at edges. Serve warm or at room temperature with whipped cream. If using frozen cranberries, do not thaw before making this recipe. Granny Smith, Gala and Jonagold are great apple varieties to use in this recipe.